Many second generation wrestlers find themselves stuck in the shadows of their famous fathers, unable to find their own identity. No one can argue, however, that this is the case for Dustin Runnels, better known in WWE as Goldust, a bizarre persona that few will ever forget. As 1994 began, Rhodes found himself feuding with Colonel Tom Parker (Robert Fuller) and his stud stable, especially with Bunkhouse Buck (Jimmy Golden). Outnumbered as Terry Funk entered the fray, Rhodes turned to Arn Anderson for help, only to see Anderson turn on Dustin at Bash at the Beach 1994. With Anderson, Funk and Buck against him, it was time to call in Dustin's father, Dusty Rhodes and even the Nasty Boys that led to a WarGames match at Fall Brawl 1994, with Dustin's team getting the victory. Rhodes feuded with Blacktop Bully (Barry Darsow), which led to the only "King of the Road" match where the two men battled on the back of a flatbed truck. Both men bled during the match in violation of WCW policy at the time and were soon released from the company. For Rhodes, it didn't take long before he was signed by WWE and resurfaced as the bizarre Goldust. Easily one of the WWE's most controversial characters, Goldust brought with him his "director" Marlena (played by Rhodes' then-wife, Terri Runnels). After months of battling mid-carders, Rhodes took aim at Razor Ramon's Intercontinental title. 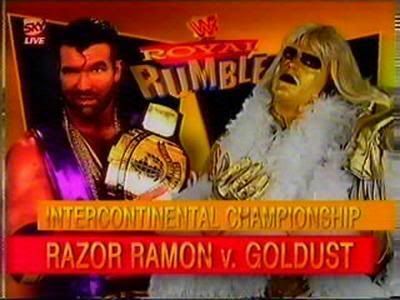 At the 1996 Royal Rumble, Goldust defeated Razor Ramon to win the title. Although he would battle Roddy Piper in a Backlot Brawl at Wrestlemania XII and in spite of the title being held up after a battle with Savio Vega in May, Goldust would retain the I-C belt until losing it to Ahmed Johnston at King of the Ring. He would battle Marc Mero, the Ultimate Warrior and even the Undertaker (defeating 'Taker in a casket match, thanks to Mankind (Mick Foley) at In Your House VIII, before facing Hunter Hearst Helmsley (Triple H) for the Intercontinental Championship. Feuding with Helmsley was enough to turn Goldust babyface, especially with the debut of Chyna who attacked Marlena. Goldust couldn't regain the Intercontinental title, but joined forces with "Stone Cold" Steve Austin, Ken Shamrock and the Legion of Doom to take on the Hart Foundation at Canadian Stampede, which led to Goldust and Brian Pillman feuding over Marlena. Pillman won the services of Marlena, but in mid-angle, Pillman suddenly died. The angle changed so that Goldust and Marlena split up. Goldust eventually turned heel and became involved with Luna Vachon, feuding with Vader and later, Marc Mero. Although Mero and Goldust would team together, the pair split up and battled each other in a mixed tag at Wrestlemania XIV. Runnels eventually turned his back on the Goldust character and began wrestling under his own name. With Terri involved with Val Venis and announcing she was pregnant with Venis's child, Dustin and Venis began to feud. By the fall of 1998, Runnels would resurrect his Goldust gimmick and finish his feud with Venis before turning his attention to Jeff Jarrett. After defeating the Blue Meanie at St. Valentine's Day Massacre, Goldust found an ally in "Bluedust" who competed with Luna for his affections. On March 29, 1999, Goldust defeated the Road Dogg (later BG James) for the Intercontinental title. Soon after losing the title to the Godfather, Runnels requested and was granted his release from WWE. 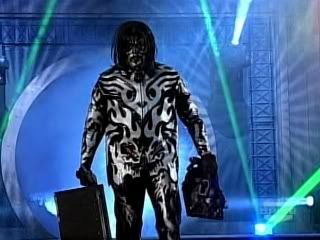 In November 1999, after several weeks of buildup, Runnels arrived in WCW as "Seven", ripping into his former Goldust persona and eventually wrestling under his real name. Runnels feuded with Jeff Jarrett, and teamed with Terry Funk against the combination of Jarrett and Ric Flair. However, Runnels turned on Funk and, later, defeated him at Uncensored before leaving WCW and work some independent dates. 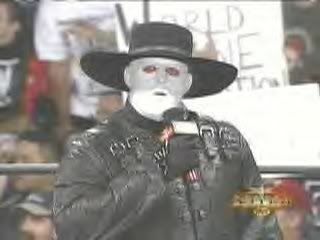 In early 2001, Runnels, as Dustin Rhodes, returned to WCW. After refusing to become part of Ric Flair's "Magnificent Seven", Rhodes found himself feuding with Flair's team instead. 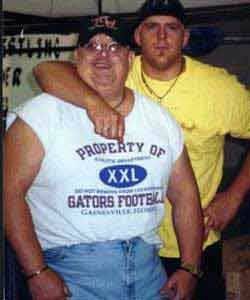 Outnumbered, Dustin brought in a reinforcement in the form of his father, Dusty Rhodes. Father and son teamed up to take on Flair and Jeff Jarrett. After WCW closed, Dusty and Dustin Rhodes opened up their own wrestling organization, Turnbuckle Championship Wrestling, even winning the TCW Championship from Scotty Riggs. Meanwhile, Goldust had made his WWE return, entering the 2002 Royal Rumble. Although he was supposed to only make the one appearance, he impressed WWE officials enough to be offered a WWE contract. Although Goldust initially wanted to become part of the NWO, he later tried to talk Booker T out of joining the organization and came to Booker's aid when the NWO turned on him. After looking for revenge against the NWO, the new team of Goldust and Booker T turned their attention towards winning the WWE Tag Team titles from Lance Storm and Christian but were unsuccessful in several title matches, including at SummerSlam. After a while, Goldust began to doubt his ability to help Booker T and almost quit teaming with him. Booker convinced him to stay with the team and at Armageddon, the pair won a Fatal Fourway match to win the WWE Tag Team titles. Their reign as tag champs ended after a loss to William Regal and Lance Storm less than a month later. Before the rematch, Booker and Goldust did agree to split after the match, but Randy Orton and Batista attacked Goldust after the match, throwing him into an electrical box. Goldust would return, but little would be done with the "electrocution" angle, and indeed Goldust would later team with Storm later that same year, in an attempt to make Lance less "boring". In November 2003, WWE had released Goldust but by February 2004, Dustin Rhodes began working for TNA (as well as taking independent dates, including for Pro Wrestling World-1). In one of his earliest TNA bouts, Rhodes battled Jeff Jarrett in an unsuccessful bid for the NWA World Championship. A few days after defeating Kid Kash at 2005's Final Resolution, Rhodes came to the aid of Cassidy O'Reilly, saving the youngster from an attack at the hands of Raven. Rhodes and O'Reilly teamed together in a loss against the Naturals, but the team of Rhodes/O'Reilly remained intact, with Rhodes becoming a mentor of sorts to O'Reilly, while continuing to feud with Raven. Rhodes left TNA in April 2005. After teaming with his father for a couple of shows for Coastal Championship Wrestling in August, Rhodes returned to WWE as Goldust, teaming with Vader and aiding Johnathan Coachman in a losing effort to Batista at Taboo Tuesday. 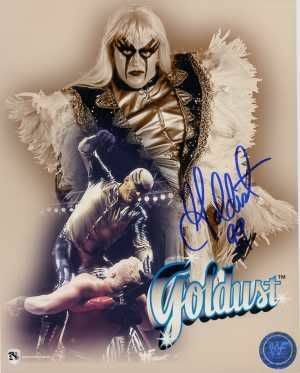 After several weeks back on the indy circuit, Goldust returned to WWE at the 2006 Royal Rumble. Goldust was seen mostly on Heat, battling Lance Cade, Trevor Murdoch and Gene Snitsky before forming a bizarre team with Snitsky. WWE released him from his contract on June 14, 2006 and Goldust, now back wrestling as Dustin Rhodes began taking independent dates. On July 1st, Dustin Rhodes defeated one of his father's long-time rivals, Tully Blanchard, in the main event of a Pro Wrestling World-1 card. It took slightly over a year before Rhodes returned to the mainstream, debuting at TNA's Victory Road to interfere in Christian Cage’s match against “Wildcat” Chris Harris. Rhodes would transform into “Black Reign” and feud with Harris at Hard Justice and No Surrender. Black Reign would also take part in a four-way Monster’s Ball Match against Abyss, Raven and Rhino at Bound For Glory.